Binge Thinking: Creepy or Automagical? Simply a Matter of Perspective? Creepy or Automagical? Simply a Matter of Perspective? One person's "automagical" can be another person's "creepy". And that is a good summary of what I am about to say in a more long-winded fashion...fair warning. The image at the top of this post is one of the neat things that I like about Gmail. 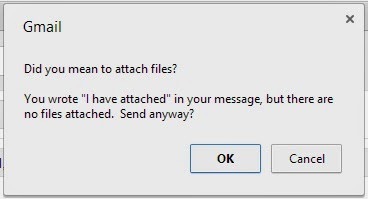 When I include some language that suggests I have attached a file to my message, but I have failed to attach anything, Gmail points that out and gives me a chance to hold off sending the message. It's rarely an issue, but every time it happens, I smile because, to me, this is exactly what Google should be doing with my information - making life better for me. Gmail is absolutely "looking at" my information to determine that. I have no problem with this. Some people find it "creepy". I find it to be automagical. Technology Marches On, And It's Freakin' Cool! We live in a time where technology is providing fantastic immediate quality of life improvements for regular people in ways that are obvious and clearly affect their daily lives. Research that, in the past, would require hours and a trip to the library, fumbling through media, can now often be done in minutes with a few keystrokes. A generation ago, you would have probably needed to travel to Rice University to look at my PhD thesis. Today, my PhD thesis is not only easy to track down, you can download a PDF to your computer in seconds. In fact, when I Google "michael casavant phd thesis nanotubes" the first hit I get is a direct link to the PDF. Although I wish I could edit it and resubmit it (I am my greatest critic)...I think this level of access is amazing and wonderful. And sure, I was one of those people that was really good at conducting library research, which has become mostly superfluous, but that's okay. Times change and some skills become outdated. It's more than worth it to have everyone enjoy more access to information. Besides, now I can say, "back in my day...". Bells and Whistles - Embrace Them, Ring Those Bells! I think my perspective stems from my desire to plumb the depths of technology. When I start using a program, I try to get to a practical level of functionality as fast possible and accomplish my immediate task, just like most people. However, after that, I always look for ways to become a more advanced user. It's fun and it can sometimes open up entirely new capabilities that you had never imagined. Spreadsheets are a great example (Excel, Google Sheets, etc.). First, you just want to get some numbers into some sort of order and possibly add or subtract them. Then you figure out how to make it look a little more professional. Eventually, you find that you want to do more complex things like look up data in a table. So you start looking deeper into formulas. Then you find you can use data in another sheet, another file, or in a database. Then you play with pivot tables and generating reports. You start patting yourself on the back and most people look to you for advice when they can't figure something out. But then, one day, you find even more. You discover you can insert queries that allow you to generate, sort, and codify data in powerful new ways. Then you discover array formulas aka, "CSE formulas" (from Ctrl+Shift+Enter, the hot key to enter an array formula), and a whole new world of capability opens up, albeit a relatively-poorly documented one. Look, I get the idea that something can seem creepy. I like some privacy. My Facebook and Google+ posts are set to friends only and I tend not to post on "Public" threads on those platforms. However, I keep Twitter and LinkedIn as public, mostly because I think one should never post something in those venues that they would be worried about others seeing. But "creepy", to me, usually requires some hint, however, tiny of malice or intrusion. So, yes, if my Gmail was reminding me of a credit card number when I had not told it to remember that data, then I would find it creepy. Perhaps the greatest difference of opinion I have with others is the importance of apparent intent for labeling something "creepy". If you knock on my door in the wee hours of the morning and tell me you just wanted to say "hi", I will probably find that creepy. If you knock on my door in the wee hours of the morning to tell me that my sprinkler head is busted and shooting fountains of water into the air, I will find that helpful, thank you, and think more highly of you. By the same notion, if an app starts arbitrarily inserting my social security number and bank accounts into my Twitter posts, I will find that creepy and alarming, but if I install an application that is supposed to notify me of events I might miss and it looks at my email to identify such things...I will find that pretty cool (although I would probably expect it to ask for access). When some new technology comes along, there will be surprises as you identify new bells and whistles. If you have a chance, give it a spin. If you don't like it, switch it off. It will happen whether or not you are happy or sad about it, I recommend happy, it's more fun. Life is too short to be stuck in the past. Don't be the person raging against "new fangled" gadgets.